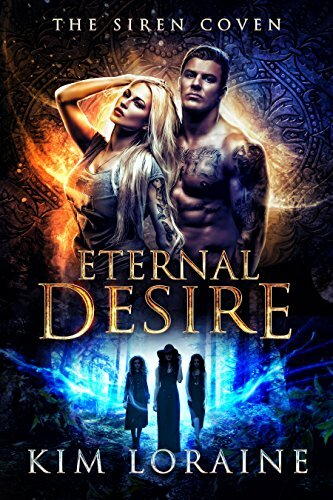 Eternal Desire by Kim Loraine is a great combination of history and magic. Izzy is a witch that has been reborn over and over. Thousands of years ago she and her sister witches, Helena and Gwen were cursed to never make it past their 27 year. Always dying in some way no matter what by the time they hit 27. After having been separate for the last numerous life times, angels have brought them together again, initially to help an angel be with his soulmate, but also to stop the rise of the witch that cursed them. Isoldt works in a local pub in London called the Witches Brew. On her night off she decided to go drinking with her sisters and runs into a devastatingly handsome man that is a shifter. Between the two of them, they can’t take their eyes off of each other. Not that he knows her name, as names have power. The two find themselves in the alley behind the bar close to action when Grant learns that Izzy is a witch and ruins any chance he has of hooking up. Though he can’t stop his attraction to her. Izzy life has been complicated, as sometimes she gets her memories quickly in her reborn life and other times she has to wait a long time. But in her life she has lived many different stories, but one trapped in history. The fated story of Tristain and Isoldt was her life once before she had remembered. They were given a love potion and become obsessed with each other thinking it was love. But hundreds of years have passed since Tristain has come back from the dead, and the witches think it has something to do with Calista the witch that cursed them. Grant finds himself drawn back to the bar to see Izzy again and finally convinces her to enjoy him again. But Grant learns something he never thought would happen. Izzy, though he calls her Beauty, is his mate. After learning this about her and knowing he wants to be with her, he learns that his pack has taken on a job of hunting three witches that are extremely powerful and trying to do bad things. Grant learns that Izzy and her sisters are the witches he is supposed to be hunting, but knows that he has to hide her instead. What things can go wrong with the wolf and witch? Can Grant protect her not only from his pack but from her curse that only has months left? This book has so many twists and turns and I liked the historical references in the book. Helena of Troy, Gwen I’m guessing of Camelot and finally Isoldt of legend. I liked how Kim picked legends and added them smoothly into her story. This is the first book in her series and I am guessing the next ones in the series will be from each of the other sisters points of view. The story is told between both Grant and Izzy’s points of view. I really liked Grant and he seems like he is the most loyal of people. There are a few things that I hope are resolved in the next book, mate links and all that, but I really liked the writing and I liked how Izzy grew in this book even though she didn’t want to and fought it at every opportunity. I’m looking forward to the next book in the Siren Coven. Pick up Eternal Desire here.